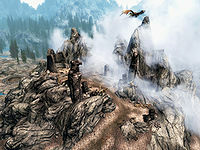 Bonestrewn Crest is a mountaintop dragon lair located south of Windhelm. It is riddled with mammoth bones, hence the name "Bonestrewn". It has a blueish mist, and a number of dragon's tongue plants grow here. It can be accessed via a slope on the south side. At the top of the hill, you can find a word wall which teaches part of the Frost Breath shout, as well as a single chest north of the wall. If you have not completed Dragon Rising, there will be three skeletons here instead of a dragon. There are two iron ore veins here; one is on the right just before reaching the top of the slope, and the other is to the right just after reaching the top. One orichalcum ore vein can be found 140 ft west-southwest, at the bottom of the mountain. This page was last modified on 15 June 2016, at 10:34.